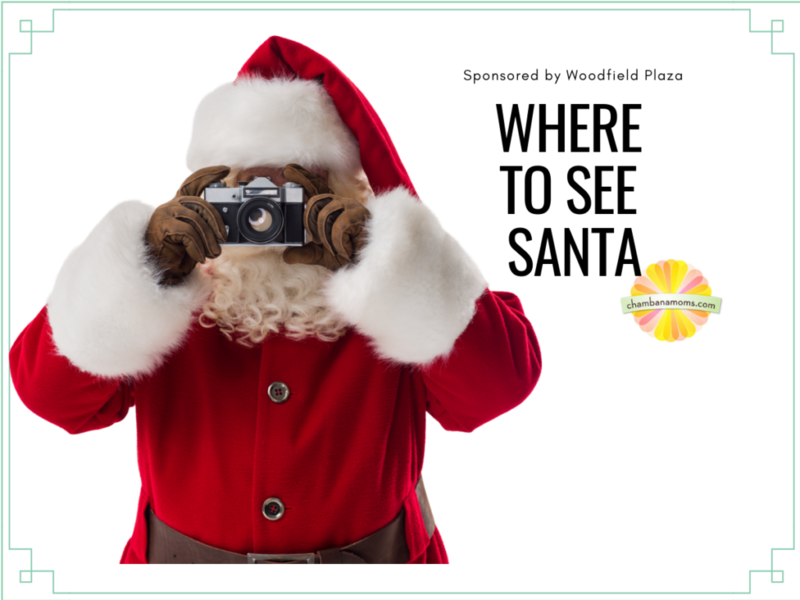 Thank you to Woodfield Plaza for helping us bring you this guide for where to take Santa pictures in Champaign-Urbana and beyond. Thank you to Woodfield Plaza in Savoy for helping us bring you all things SANTA in Champaign-Urbana on chambanamoms.com this holiday season. Santa Claus is coming to Champaign-Urbana! We have rounded up a list of all the local places where your child can see him and ensure their spot on the nice list this year. So gather your cameras and have your child check their wish list before visiting the jolly man before he makes his trip back to the North Pole. First things first: we know Santa is EVERYWHERE this holiday season. Be sure to look at our calendar for many events such as Santa breakfasts, parades, and other places where Santa might show up. Always have your camera (or smartphone if you have one) charged and ready! This list contains events where we are pretty sure Santa will be camera-ready and waiting for your little elves, and contains FREE or low-cost events *without* registration. Some may be free; some may be by donations. Some may take photos; most are BYOC (aka bring your own camera). BE PREPARED! Know of a Santa photo op not on our list? Please email us. This annual indoor Christmas Craft Show brings together over 300 vendors and thousands of shoppers! Harvest lunch, free parking and pictures with Santa! $1 donation for admission. Pictures with Santa available from 9 a.m. to 3 p.m.
On Saturday, Nov. 17, get free photos with Santa in Mansfield. On Saturday, Nov. 17, children can meet Santa Claus in Ace Hardware and have their picture taken for free in downtown Gibson City, following the parade. Parade starts on South Wood Street near County Market, making its way along First Street to Sangamon Avenue, where it turns north and moves down Tenth Street. This annual indoor Christmas Craft Show brings together over 300 vendors and thousands of shoppers! Harvest lunch, free parking and pictures with Santa! $1 donation for admission. Pictures with Santa available from 10 a.m. to 2 p.m.
One of the largest Christmas parades in central Illinois with marching bands, holiday floats, Shriners, antique cars and tractors, and much more! This year's theme is "Christmas in the Wilderness." Santa will be stopping by Sunset Christmas Tree Farm on Saturday, November 24 at 1 pm. Stop by to see him! See Santa on Friday evening, Nov. 30 at the Community Building and again on Saturday immediately following the Tuscola Christmastown parade for pictures on Dec. 1 (both free). Or, there’s also Breakfast with Santa on Saturday morning in Tuscola (nominal fee). Please bring your own camera for pictures! On Nov. 30, Santa will arrive by fire truck at 6 p.m. in downtown Mahomet. Photos will be available then and on Dec. 1. This lighted parade begins at 6pm and has activities at the Rantoul Area Chamber of Commerce following the parade, like music, laughter, visits and pictures with Santa both before and after the parade, and reading with Mrs. Claus. The parade will begin on Chanute, turn left onto Sangamon Ave, and continue into Downtown Rantoul. It will end in the old Roger's parking lot, located off of Kentucky Ave.
An evening Lighted Christmas parade brings Santa to Downtown Arthur at dusk. Buggy rides, free BBQ sandwiches for lunch, hot chocolate and cookies with Santa after the parade. Spend the day in Arthur! Enjoy donuts, milk crafts, activities, and a visit with Santa at the Mahomet-Seymour High School Cafeteria! Bring your camera! Tickets are $3 per child, $1 per adult. Purchase ahead of time at locations listed in event. It's a day of Christmas Merry Making in Homer. Santa will visit with children from 10 a.m. to noon at the Homer Library. Free. Bring the kids to see Santa & Mrs. Claus, where they can decorate cookies at Mrs. Claus’s Bakery, mail Santa a letter at the North Pole and have a photo op with Santa. Stop by the Cocoa Corner to enjoy a free cup of cocoa. Sweets and shopping available, too. Hosted by the Rector Real Estate Team. Chelsea Grace Photography will be available for free family portraits with Santa! Saturday, Dec. 1 at Keller Williams Office, Champaign. The Tuscola Christmastown Parade begins at 11 a.m. The parade starts at Ervin Park and ends at the community building. Stop by the Santa Shop at the Community Buiding from 11am-2pm, where kids can shop for their parents, take pictures with Santa at the Community Building from 11:30am-12:30pm and more festivities, too. Kick off the holiday season with a parade in downtown Monticello at 11:30 a.m. on Dec. 1. The parade theme is “Twelve Days of Christmas." Santa might be there! Head over to the FroYo Factory after the Monticello Christmas Parade for a sweet treat with Santa from 12-4pm. Pictures with Santa from 1-2pm with tipoff at 2pm. Also, pop-up shops, holiday crafts in the Kids Zone, FREE Illini ornaments for the first 300 fans and more! Share in the holiday spirit and celebration of the birth of Jesus! Free pictures with Santa 3:30-4:30pm, food, games, Nativity and Ornament Crafts, and gift prizes! FREE. Santa’s coming to Arcola for breakfast, $5 per person. Stick around for a parade in downtown Arcola. There is a $5 fee. Tickets may be purchased from any Savoy rotarian or contact Dee at 649-9551. There will be games and treats and a visit from Santa. CU Autism Network Breakfast with Santa includes breakfast, cookie decorating, and more with Santa. Check with hosts to see if space is still available. Join us for breakfast, Christmas crafts, and a special visit from Santa! Free event but you must RSVP by Dec 6. Join the Down Syndrome Network for the DSN 2018 Holiday Party at the Hilton Garden Inn on Saturday, December 8, 9:30-11:30 am. A delicious brunch will be served and Santa will visit with presents! Register by Dec 5 at the link in event. A Magical Day with Santa & Friends! Visit with Santa & his friends-Frosty the Snowman, Rudolph & Santa’s favorite Elf! Enjoy holiday carnival games and all children will receive a stocking filled with Christmas goodies from Santa himself! FREE. Happens Dec 8 and 15, 10am-6pm. Autism Services Group is hosting a Sensory Santa event with minimal noises, reduced lines, and free refreshments. This event is created for children with special needs and their families. Santa will be arriving in St. Joseph at 10 a.m at the Main Street Station. FREE. Please consider bringing non-perishable food and items for the community food pantry. Disability Resources & Educational Services at UIUC Holiday Party Open House is hosted by Delta Sigma Omicron (DSO), the disability service organization at the University of Illinois, C-U Special Recreation, and AMBUCS and is open to all children with disabilities and their families in the Champaign-Urbana area. Register at the link in event. Stop in for a free photo with Santa at Ryan Dallas Real Estate. At Stephens Family YMCA, Santa visits during the first hour will be sensory friendly and take place in the community room. During the second hour, visits will be held in the lobby where there will be more exposure to noise level, crowds, etc. No registration. At Stephens Family YMCA, Santa visits will be held in the lobby where there will be more exposure to noise level, crowds, etc. No registration. No need to RSVP, all families in the community are welcome. Make sure to bring your camera, you won't want to miss an opportunity to get pictures with Santa. Visit Santa at Lincoln Square Mall! You can do photos on your own with a donation or purchase an available package. 1 pm on Saturday, Dec. 15 at St. Patrick’s Church, Tolono. Free photos, but the event is a fundraiser. Holiday fun at the Virginia Theater on Sunday, Dec. 16, 1 -4 pm. During the event, we will have pictures with Santa, caroling, hot chocolate, and trolley rides through Downtown Champaign. Tickets available at the door, $3 per person. See Santa on Sunday, Dec. 16 from 1 -3 p.m. before he goes back to the North Pole. FREE. Spin around the rink at Skateland with Santa on Sunday, Dec 16 from 1-4pm. Admission is $6 per person with skate rental extra. At Sweets with Santa – presented by the State Bank of Bement – children will have the chance to chat and get their picture with Santa, read a story with Mrs. Claus, create their own crafts, and nibble on festive treats. Buy tickets ahead of time as it tends to sell out! Head to Willow Branch Township Library in Cisco and enjoy a visit with Santa. Cookies and a few craft options will make the morning a fun event for the whole family. Santa Arrives at Marketplace Mall: Santa comes to Champaign-Urbana on Saturday, Nov. 17 and will be in town through Dec. 24. Santa has made his way from the North Pole and is ready to greet children of all ages. Special deals available if purchased in advance, and reservations can be made. Reservations and photo packages are NOT required to visit with Santa, but payment is required to get a photo. Lincoln Square Mall:Visit Santa at Lincoln Square Mall! You can do photos on your own with a donation or purchase an available package. Let us know what we missed, and check back often for new opportunities. Want more info on Champaign-Urbana holiday fun for your family? First, visit our GIGANTIC HOLIDAY FUN GUIDE. And, sign up for our Ho Ho Holidays email newsletter, and you’ll get 24 days of holiday info in your inbox, starting Dec. 1.